Sanjeev Kapoor is one of India’s most famous chefs, hosting Asia’s longest running cooking show Khana Khazana and a regular on Masterchef India, he also has multiple restaurants around the world (including another Signature in Abu Dhabi). The Dubai venue is based in Bur Dubai in the Meliá hotel, but is still worth travelling to if you live at the other end of town. A testament to its success is that it has been situated on the same spot from nearly 20 years, and is regularly packed with people – a rare achievement in Dubai’s fast changing restaurant scene. Over Ramadan, the hotel is offering two set menus – one vegetarian and one meat, with four courses (each course however, includes multiple dishes, so there is no chance of you leaving hungry). The menu has a balance between traditional Indian dishes (the lamb shank and the chicken biriyani are delicious) and some more theatrical dishes (there’s plenty of pipette -filled plates, and dry ice for those who enjoy that type of fare). The lalla mussa dal was a standout dish of the evening, as was the cilantro prawns. The restaurant staff were incredibly friendly, and were knowledgeable when chatting about different dishes. If you have any food allergies or intolerances be sure to be clear about these early on, so the kitchen understands what you can and cannot have. Despite the restaurant being full, the staff were on the ball and quick to serve different tables. The chef also came out of the kitchen to chat with different people dining. 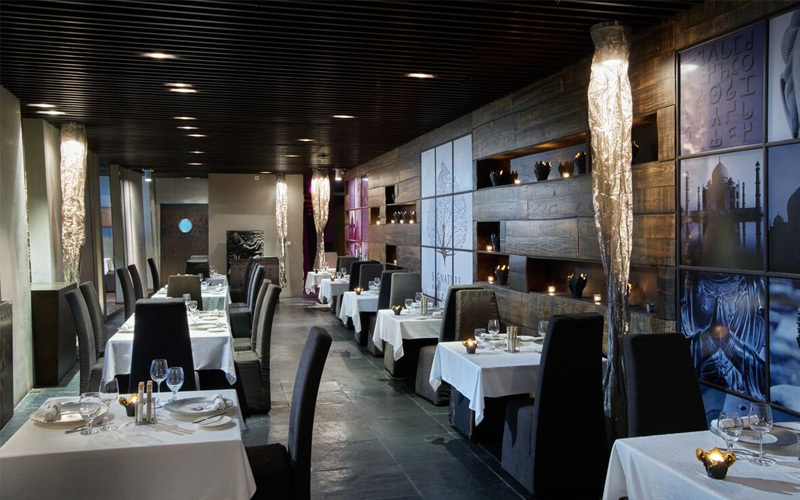 Despite being a fine dining restaurant, Signature does well with large family gatherings, with adults and children of all ages. The restaurant has good food and drink without any pretensions. The restaurant has dark stone floors and wooden paneling on the walls along with gold material over the lights, meaning that regardless of the time of day, the place is always dimly lit. On the Friday night that BBC Good Food Middle East visited, the restaurant was busy with families enjoying a weekend meal. Details: The set iftar menu cos AED 149 per person from 7pm until midnight daily. The a la carte menu and bar are also available. For more information, visit Signature by Sanjeev Kapoor. To book a table call 04 386 8111.